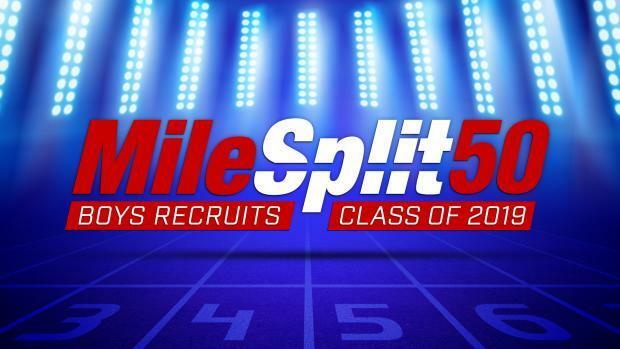 MileSplit made a subjective ranking of the top 50 boys recruits in the Class of 2019 ahead of the National Letter of Intent signing period, which continues to run through August 1. We ranked our top 50 athletes based on a tiered rating system, current MileSplit50 track and field, and cross country rankings, state records, historical results and performances over national competition. 1 +3 Mario Heslop (NJ) Sprints N/A Heslop is one of the top guys in the class of 2019 in everything from the 55-meter dash indoor to the 400m outdoor. He's one of eight guys to run under 21 in the 200m indoor. He had an amazing season overall: he ran the 200m dash six times and every time he ran sub-21.88. He PR'd in the 60m dash running 6.70, but also placed third at NBNI in the 60m with a 6.73. Heslop also ran a season's best in the 400m (49.23). The senior ran solid all season but poured it on at the end when it counted the most. He finished off this indoor season winning the 200m dash at NBNI (20.90) and placing third in the 60m dash (6.73). 2 +18 Matthew Payamps (NY) Distance Georgetown University Matthew Payamps had a solid resume coming into this indoor season, but he really elevated himself to the next level with some big races. Payamps improved his mile time to 4:12.39, his 800m time to 1:54.73, his 600m time to 1:20.45, his 3000m time to 8:31.01 and his 1000m time to US No. 2 all-time 2:23.46. Watch for him to continue to run well into the outdoor season. 3 +41 Jake Renfree (TN) Distance University of Notre Dame Jake has been one of Tennessee's top distance athletes over the past few years. He finished the 2018 cross country season placing second at Foot Locker Nationals running 15:19.50. In the indoor season, he improved all of his PRs. In the 800m, he improved to 1:52.33; in the 1600m, he improved to 4:12.40; and in the mile, he improved to 4:06.39. His 4:06.39 in the mile won him the NBNI title and was the fastest time during the indoor season. 4 +6 Liam Anderson (CA) Distance Stanford University In the fall Anderson won NXN and has already run 8:56.88 for 3200m outdoor and an 800m PR of 1:57.02 for the 2019 outdoor track season. He's easily one of the top distance recruits in the country. 5 +18 Matthew Boling (TX) Jumps/Sprints University of Georgia Boling is one of the top 400m runners in the nation. He clocked a 46.15 last year to win his region meet in Texas. He has a handful of other sub-47-second performances including a 46.76 which he ran to place second at the UIL Track and Field Championship. Already during the 2019 outdoor season, Boling has clocked a wind-legal 10.22 in the 100m, 20.58 in the 200m and 47.23 in the 400m. He's also had some big jumps, including two 25-foot long jumps. 6 -1 Tyrese Cooper (FL) Sprints University of Oregon Cooper has age group and class national records to his name. He is one of the top recruits in the nation in the 100m, 200m and 400m. This indoor season we did not see him compete as much as normal, but when he did, he ran some of the top times in the nation, including US No. 9 34.17 in the 300m, and US No. 16 1:05.52 in the 500m. He's also run fast times in the 100m, 200m and 400m already in the 2019 outdoor season. 7 -5 Kurt Powdar (VA) Hurdles University of Florida Kurt Powdar added himself to the top 10 all-time 55mH list this indoor season. He ran 7.04 at the Bullis Champion Speed Invitational to bacome the third-fastest performer all-time. In 110mH outdoor, Powdar holds a PR of 13.59. His 13.59 won New Balance Nationals Outdoor last spring. 8 -5 Nick Foster (MI) Distance University of Michigan Nick Foster is one of the best distance recruits in the class of 2019. He's run outdoor PRs of 4:05.50 in the mile, 8:54.80 in the 3200m and 15:03.10 for 5K in cross country. This indoor season, he improved his indoor times to 1:53.73 in the 800m, 4:07.16 in the mile and 8:57.56 in the 3200m. He concluded his 2019 indoor season with a third-place finish in the mile at NBNI. 9 +22 Sam Affolder (VA) Distance University of Washington Sam Affolder has been one of the top distance runners in the nation since his sophomore year when he finished second at the Foot Locker Northeast Regional. The Loudoun Valley senior holds indoor PRs of 1:56.32 for the 800m and 4:09.68 for the mile. Outdoors he's run 4:15.29 for the mile, 8:59.82 for 3200m and 9:16.43 for the 3000m steeplechase. To cap off his indoor season, Affolder helped Loudoun Valley run 7:40.49 for US No. 3 all-time in the 4x800m, 17:01.81 in the 4xmile and 9:54.41 in the DMR, both for new national records. 10 -3 Sean Dolan (NJ) Mid-Distance Villanova University Sean Dolan is one of the most well-rounded mid-distance runners in the class of 2019. He holds some of the top times in the nation. His times in the 800m indoors and outdoor are top five in the nation. His outdoor mile time of 4:08.86 is fifth-best in the class of 2019. He ran that time to place second at the adidas Boost Boston Games. He improved his indoor times this season to 2:25.39 for the 1000m and 4:09.55 for the mile. 11 -3 Luis Peralta (NJ) Mid-Distance University of Oregon Peralta has strong consistency in the 800m with a bunch of times sub-1:51 and two times sub-1:50, not to mention he was the 2018 New Balance Nationals Outdoor champion in the event. This indoor season, he didn't improve his 800m PR at all but he did improve his 600m PR to 1:19.14 and his 1000m PR to 2:24.53. He finished second in the 800m at NBNI but was the top-placing American athlete, since the winner, Abdullahi Hassan, is from Canada. 12 -1 Taylor Banks (FL) Sprints Florida State University Taylor Banks is one of the nation's best sprinters with some of the top outdoor times in the class of 2019. He's run a FAT wind-legal 10.26 in the 100m and a FAT wind-legal 21.18 in the 200m. 13 -1 Nicholas Ramey (GA) Sprints University of Southern California Nick Ramey is one of the top sprinters in the nation. Both on the track indoor and outdoor Ramey has excelled clocking times of 21.73 for the 200m indoor and 21.14 outdoor. He's also run 46.78 in the 400m indoor and 46.20 outdoor. He's just off the top 10 all-time in the 400m indoor. This indoor season, we only got to see Ramey run once but he made it count, clocking a 33.70 US No. 3 in the 300m. 14 -13 Brian Herron (GA) Sprints University of Southern California One of the top sprint recruits in the nation. He has clocked top all-time marks indoor in the 200m (20.95), 300m (32.64) and 400m (46.31). His 300m mark is the high school national record. He's been very limited in racing since the 2018 indoor season. 15 +17 Carter Cheeseman (TX) Distance University of Notre Dame Cheeseman has been stellar on the cross country course. In 2017 as a junior, he made it to both the national meets and placed 36th at Nike Cross Nationals and sixth at Foot Locker Nationals. During the 2019 cross country season he placed 27th at NXN, 10th at Foot Locker and sixth at the USATF Cross Country National Championships. He's improved his indoor track performances this season to 4:11.27 in the mile and 14:40.01 in the 5K. At NBNI, he won the national title in the 5K and finished seventh in the mile. 16 -3 Devin Hart (NJ) Distance Stanford University Devin Hart may best be remembered for his crazy double last season when he ran 8:53.36 for 2 miles at Brooks PR and then flew across the country back to New Jersey where he ran 8:58.58 for 3200m. Hart also holds a 5K track PR of 114:44.06 which he ran to place third at New Balance Nationals Outdoor in 2017. This indoor season Hart really poured it on as well improving his indoor times to 8:54.45 for 3200m, 8:56.89 over 2-miles and 4:14.60 in the mile. His 8:56.89 2-mile won him the NBNI title. 17 -11 Ryan Oosting (MA) Distance Stanford University Oosting had a strong junior season in track where he clocked some of the top times in the nation in the distance events. He holds outdoor PRs of 8:53.46 for 2 miles and has clocked a 4:14.09 in the full mile. This indoor season, his biggest race was finishing second in the 2-mile at NBNI running 8:57.37 just behind Devin Hart. He also ran a PR in the mile of 4:11.78 to place third at the New Balance Indoor Grand Prix. 18 +25 Sincere Rhea (NJ) Sprints/Hurdles Penn State University Rhea clocked a wind-legal PR of 13.84 in the prelims of New Balance Nationals Outdoor 110mH race in 2018. He then went on to run a wind-legal 13.96 to place fourth in the finals. During the 2019 indoor season, Rhea won the 60mH at NBNI (7.69) and finished the season with a US No. 2 time of 7.64. 19 NEW Justin Forde (CT) Jumps University of Miami Forde had a strong indoor season, which is what propelled him onto this list. He finished out the year ranked US No. 1 in the triple jump (51-3), US No. 3 in the high jump (6-10) and US No. 17 in the long jump (23-5.5). He also took home gold in the triple jump at New Balance Nationals Indoor with his jump of 51-3. 20 -5 Jeremiah Willis (NY) Sprints/Jumps University of Louisville Willis the NYSPHSAA - NY state champ in the long jump and triple jump has some of the best wind-legal marks in the class of 2019. The Cicero-North Syracuse senior jumped 49 feet, 9.25 inches last spring in the triple jump and 24 feet, 3-inches in the long jump. Willis has also performed well indoors with marks of 24-5.5 in the long jump and 49-5.75 in the triple jump. This indoor season, he finished third in the long jump at NBNI and sixth in the triple jump. He improved his indoor triple jump PR to 49-7.25. 21 -4 Daniel Maton (WA) Mid-Distance University of Washington Daniel Maton is a strong 800m/1600m runner who ranks top 10 in the class of 2019 outdoor for both events. Maton has clocked outdoor PRs of 4:08.13 in the mile and 1:50.79 in the 800m. Over the 2019 indoor season he improved his mile time to 4:09.97 and his 800m time to 1:51.88. In the 2019 outdoor season he's already clocked a new 3200m PR of 9:08.45. 22 -8 Andre Turay (MD) Hurdles Texas A&M University Turay had a strong showing last year and has emerged as one of the top hurdlers in the class of 2019. He's run 13.73 FAT wind-legal in the 110mH and 37.72 in the 300mH. He finished the season as part of two national record-setting relay teams (4x4 and 4x2) and as the US No. 3 60m hurdler in the nation with his time of 7.74. He did not compete in the finals of the 60mH at NBNI. 23 -5 Haze Farmer (AR) Pole Vault University of Georgia At the end of the 2018 outdoor track season, Farmer was the top returning pole vaulter in the nation with his vault of 17-feet, four inches. In total he's vaulted over 17 feet 12 times, the most of anyone in the class of 2019. He finished off the 2019 indoor season ranked US No. 3 with a vault of 17-5. 24 -5 Max Manson (CO) Pole Vault Stanford University Manson is not far off of Farmer's outdoor PR of 17-4 in the pole vault with his mark of 17-3.5 which he vaulted to win the Colorado State Track and Field Championships in 2018. Indoors, however, Manson has now vaulted higher than Farmer after clearing 17-5.5 to win NBNI. In total, Manson has eight vaults between indoor and outdoor over 17 feet. 25 0 Charles Lewis (AL) Sprints Louisiana State University (LSU) Lewis has clocked some of the top sprint times in the nation. He holds a wind-legal PR of 21.02 in the 200m, which ranks seventh in the class of 2019. He's also run a wind-legal 10.54 in the 100m; he ran that time in the prelims of New Balance Nationals Outdoor. In the finals at NBNO, he ran 10.57 to place fifth. He's a four-time AHSAA State Track & Field 4A-7A state champion, including one 100m state title, one 400m state title and two 200m state titles. This indoor season he clocked PRs of 6.91 in the 60m dash, 21.15 in the 200m and 33.57 in the 300m dash. 26 0 Caleb Jackson (AL) Sprints N/A Jackson has wind-legal PRs of 10.46 in the 100m and 21.22 in the 200m. He was last year's AHSAA State Track and Field 4A-7A 100m state champion. 27 0 Joshua Brockman (NC) Hurdles NC State University Brockman ranks among the top in his class for the high hurdles. He has the third-best 110mH time with his 13.86 from the 2018 Atlanta Georgia Relays. He finished off the 2019 indoor season ranked fourth in the nation in the 60mH with his 7.76 performance from NBNI. 28 0 Bryan Hudson (KY) Throws N/A Hudson tops the shot put rankings for the class of 2019 with his mark of 65-6.25, which he threw to place fifth at New Balance Nationals in 2018. He also ranks third in the class of 2019 for the discus with a mark of 198-1. He threw that to place second at New Balance Nationals Outdoor last spring. 29 -20 Drew Bosley (WI) Distance Northern Arizona University Drew Bosley made a statement last year clocking a 14:32.75 for 5K on the track to win the USATF Junior Outdoor Championships, not to mention he placed 11th at the Great Edinburgh XCountry in Edinburgh, Scotland, last January. This year, he dabbled in indoor running new PRs of 1:56.89 in the 800m and 8:59.95 in the 3200m. He also competed at the USATF Cross Country Championships, running 25:18.00 for 8K to finish 14th. 30 -1 Tylin Jackson (TX) Sprints University of Arkansas Jackson has one of the top wind-legal times in his class for the 200m dash. The senior clocked a 20.75 in the 200m last April to win his district meet and move on to the Texas State meet. In the 100m Jackson has run an all-conditions PR of 10.50. 31 -10 Joseph Fahnbulleh (MN) Sprints University of Florida Joseph Fahnbulleh has some of the top sprint times in the nation. In the 100m, he's run all-conditions 10.54 and wind-legal 10.63. In the 200m, he sits at the top of the class of 2019 after running a wind-legal 20.69 to win the USATF National Junior Olympic Track & Field Championships. 32 NEW Randolph Ross (NC) Sprints N/A Ross had a strong 2019 indoor season with his biggest performance being his third-place finish in the 400m at NBNI when he ran 47.57 for US No. 3. He was also US No. 6 300m (33.80), tied for US No. 24 in the high jump (6-8) and US No. 8 in the 500m (1:04.88). 33 -11 Myles Marshall (GA) Hurdles Ohio State University Marshall has one of the top 110mH times in the nation with his wind-legal 13.87 from the USATF National Junior Olympic Track & Field Championships. He was also sixth in the 110mH at New Balance Nationals Outdoor in 2018. This indoor season, he was All-American in the 60mH after finishing sixth and running 7.87. 34 +11 Matthew Rizzo (NY) Mid-Distance Stanford University Rizzo has run some of the top times in the nation for 800m. Indoor, Rizzo holds a PR of 1:52.55, which he ran to place seventh at New Balance Nationals Indoors in 2018. He's run about the same time outdoor with his 1:52.51 from the Saint Anthony's Invite last May. This indoor season Rizzo ran a US No. 6 all-time in the 1000m at the NYS-Indoor Championships and Helped his team win the SMR national title. 35 +2 Caleb Cavanaugh (TX) Hurdles University of Georgia Cavanaugh is one of the top short hurdlers in the nation having clocked PRs of 37.20 in the 300mH and 51.53 in the 400mH. He's not far off of being one of the top guys in the high hurdles as well with an all-conditions PR of 14.32 in the 110mH. 36 +2 Frank Royal (VA) Jumps/Sprints UCLA Royal has the top wind-legal long jump mark in the class of 2019 with his jump of 24-4.5 from the USATF Junior Outdoor Championships. He finished third there with that mark. He was also third at New Balance Nationals Outdoor with a jump of 23-5. He's one of the nation's top jumpers both indoors and out. This indoor season he ran a new PR of 35.72 in the 300m but wasn't as close to his jump PRs. Snyder has one of the top triple jump marks in his class. Last year, the senior jumped 49 feet, 3.25 inches to place third at the Bojangles Track & Field Classic. He's also jumped over 24 feet in the long jump three different times in his high school career. 38 NEW Alfred Chawonza (NJ) Mid-Distance Texas Tech University Chawonza had a strong indoor season, which helped to land him on this list. The senior capped off his season with running US No. 1 in the 800m (1:50.57), US No. 2 in the 600m (1:19.61) and US No. 5 in the 1000m (2:25.77). He was also on the US No. 3 4x800m team (7:42.53). He finished sixth in the 800m at nationals, helped his team win the 4x4 in a US No. 2 time of 3:18.36, helped them take second in the SMR with a US No. 2 time of 3:27.55 and helped the team place third in the 4x800m (7:42.53). 39 -5 Camren Fischer (AR) Distance Princeton University Fischer made it to both of the national cross country meets in 2017 as a junior and well as this past fall (2018) as a senior. On the track, he holds PRs of 1:55.06 in the 800m, 4:13.03 in the mile and 9:18.35 in the 3200m. 40 -4 Parker Stokes (NY) Distance Georgetown University Stokes has one of the best 2K steeple performances of all time. The Maine-Endwell High School senior clocked a 5:53.74 to win New Balance Nationals Outdoors last year. He has also run some strong times in the 3K steeple (9:05.67) and the 3200m (9:11.26). He finished third in 2017 at the Nike Cross Nationals New York Regional and went on to place 27th at Nike Cross Nationals. In 2018 he won the NXN New York Region meet and went on to place 22nd at NXN. 41 -2 Carlos Aviles (CA) Throws Ohio State University Carlos Aviles holds some of the top marks for the class of 2019 in the throwing events. He holds an outdoor shot put PR of 63-5.5 and a discus PR of 194-1. His shot put PR is fourth in the class of 2019, while his discus mark is sixth. 42 -2 Edward Richardson III (VA) Sprints/Hurdles University of South Carolina Richards was sixth last year at New Balance Nationals Outdoor in the 400mH, running a PR of 52.59. He's also clocked some quick times in the sprints, including a 34.31 in the 300m and 1:04.13 in the 500m indoor. He ran a PR of 47.96 in the 400m in 2017. 43 -13 Khaleb McRae (NC) Sprints/Hurdles N/A McRae has run everything from the 100m to the 1500m, but some of his best marks have come in the shorter distances. In the 300m indoors, he's run 35.46, which ranks 24th in his class, and in the 500m he's run 1:04.01, which ranks third in his class. 44 NEW Aiden Felty (MA) Throws Duke University Aiden Felty emerged as the top shot put athlete in the nation for the 2019 indoor season. He won NBNI throwing 66-08.75 to beat Patrick Piperi (TX), who threw 66-03.75 just one throw before him. 45 +2 Tanner Duffin (GA) Throws N/A Duffin may top the class of 2018 discus rankings, but he only has one mark over 200 feet. He has a few that are close, including a 193-6.5 which won him the Georgia High School Meet of Champions. In the shot put, he ranks seventh in the class of 2019 with a throw of 61-8.5. He competed this indoor season and finished ranked US No. 10 with a throw of 62-0.5. He was ninth in the event at NBNI and 11th in the weight throw with a mark of 66-9.25. 46 -13 Charles McBride (NC) Jumps Campbell University McBride has had strong performances in both the vertical and horizontal jumps. In the high jump, the Apex (NC) senior has 7-0.25 both indoors and outdoors. He also holds a solid mark in the triple jump with his all-conditions jump of 46-2, which he hit to win the NCHSAA 4A Mideast Regional meet. 47 +1 Patrick Piperi (TX) Throws University of Texas Patrick Piperi has strong marks in both the shot put and discus. He placed second last year in the shot put at the Class 6A UIL Track and Field Championships throwing 62-10.5. In the discus, he placed third, throwing a PR of 184-feet. He ranks sixth in the class of 2019 for the shot put and 18th in the discus. He finished the indoor season ranked US No. 2 and finished second at NBNI with a throw of 66-3.75. 48 -13 Jacob Furland (RI) Throws Winthrop University Furland is the top hammer thrower in the country with a PR of 219-10. He's thrown over 200 feet several times in his career including a throw for 210 feet, 11 inches, which won him the New Balance Nationals title last spring. 49 NEW Trey Allen (AL) High Jump N/A Allen finished the indoor season as US No. 1 in the high jump (7-0). He went undefeated in the event including the NBNI title. He jumped 6-10.75 to win NBNI. 50 0 Shea Weilbaker (NY) Distance Georgetown University Shea has strong times in everything from the mile indoor (4:13.74) to the 3200m outdoor (8:59.46). He was the NYSPHSAA State Champion in the 3200m both indoor and outdoor in 2018 and made it to NXN during the 2017 and 2018 cross country seasons. In 2018 he finished the season placing 25th at NXN.